The candidature of President Muhammadu Buhari in the 2019 presidential election with the expectation of an Igbo born president in 2023 is not enough sweetener to draw Igbo votes to the president, a cross-section of Igbo leaders has deposed. In separate responses to Saturday Vanguard, the Igbo leaders affirmed that nothing short of the restructuring of the country to put the various geopolitical zones on equal footing would appease them. 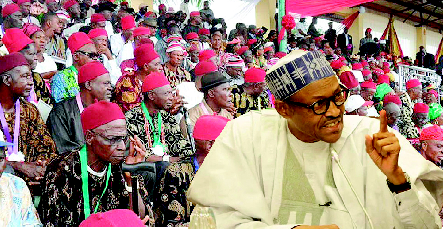 The leaders, including elements from the apex Igbo socio-cultural body, Ohanaeze Ndigbo, politics, and other Igbo-centred organisations dismissed suggestions that voting for President Buhari in 2019 would make the prospect of an executive president of Nigeria from the Southeast a realisable prospect. One of President Buhari’s leading canvassers in the Southeast, Mr. Osita Okechukwu, director-general of the Voice of Nigeria, VON was, however, unwavering in his expectation that Buhari was the surest and safest channel to the realisaiton of a Nigerian president from the Southeast. Okechukwu further deposed that the Buhari administration had done enough to earn the confidence of the people of the region. Among those who spoke to Saturday Vanguard on the issue were a former minister of health, Prof. ABC Nwosu, former president-general of Ohanaeze Ndigbo, Dr. Dozie Ikedife, chairman of the Senate Southeast Caucus, Senator Enyinninya Abaribe, National Chairman, United Progressives Party, UPP Chief Chekwas Okorie, Secretary of the Eastern Consultative Assembly, ECA, Evangelist Elliot Ugochukwu-Uko among others. Ndi Igbo voting for APC in 2019 hoping to become president in 2023 will be making the biggest mistake of their lives. They will in effect be voting themselves into irrelevance and second-class citizenship in Nigeria. How can the APC where the leadership consisting of President Buhari, Vice President Osinbajo, the chairman of Party, Odigie-Oyegun and national leader, Asiwaju Bola Tinubu midwife an Igbo presidency in 2023? How will that happen? It cannot happen. As Chief MKO Abiola asked: How can you shave a man’s hair in his absence? The best option for Ndigbo is to look for an alternative where they are represented in the center of power in 2019. Ndi Igbo being represented at the centre as Vice Presidential candidate in 2019 will ensure that they are not dealt out in the backrooms where who shall become president and who becomes vice president are settled. If Ndi Igbo are in an alternative political party that absorbs a third force, this will put them at the center where they will make sure that they are represented. They cannot afford to wait till 2027 and so, the northern presidential candidate in this alternative party shall serve out the remaining four years and no more. All those advocating that Ndi Igbo should wait till 2027are enemies of Ndiigbo and consequently, enemies of Nigeria because Ndigbo are nation builders. For emphasis, the Igbo ethnic group cannot endure beyond 2023. The restiveness in Igbo land and the neo-Biafra agitations are self-evident and only opportunistic ambitious presidential candidates will fail to see this restiveness. The tenure of the president that will emerge in 2019 must be for years only. If Mandela with all his greatness did four years, the next President of Nigeria must do four years and give way in the interest of peace and political stability. This was what the north had expected of President Jonathan in 2015. The rest is history. Ndigbo must avoid like leprosy any presidential candidate whose body language indicates eight years especially those of them who have no views on restructuring which is the topmost Igbo agenda currently. For the Igbo, restructuring is top of the agenda. The presidency is second. And good governance can only happen when there is peace and security. Restructuring brings about massive devolution of power and resources from the centre to the federating units and stops the massive roguery at the centre. The Igbo position is that there must be devolution and restructuring of Nigeria. Those benefiting from the present unfair structure are the ones resisting restructuring not realizing that they are hurting themselves in the long run. The summary is that if Ndigbo vote for APC in 2019, they will be voting themselves into slavery in Nigeria. So, the alternative should be for them to look for a platform that offers only a four-year waiting period, a platform where an Igbo man is at the centre, preferably as the running mate. That’s what the Igbo should be looking for. Ndigbo expect that any Nigerian whether from the north, south-west or South-South will show understanding that continuing to exclude a major group in Nigeria from the presidency is wrong and a recipe for political instability. “I can tell you with every authority that there is nowhere Igbo sat and had any meeting, not to talk of whether they agreed or not to support Buhari. The Umbrella body of Igbo people remains Ohaneze, and the president-General had overreached himself sometimes when he said that the turn of Ndigbo would be 2023 and I am sure he received disapproval from so many prominent Igbo and young ones. And he has not repeated that statement or retracted it, but it is not the position of Ohaneze or Ndigbo. “It will be political naivety for any Igbo man to think that it will be the turn of Ndigbo at any given date in the future. Political power is not given. It is struggled for. It is taken. So, the Igbo people have to do what is necessary and reach out to other political parties to project any Igbo person to run for president. Our position is that the presidency of Nigeria is open to everybody and Igbo people are not shying away from it. I am not interested in who or when Igbo will produce president in Nigeria. We have gone beyond that. The large number of agitators for self determination is an indication that the people want to be on their own. Because there appears to be lack of coordination among the pro-Biafra agitators, we are trying to set up a coalition that will coordinate the activities of those clamouring for self determination. The good thing is that none of them is saying it does not want Biafra. Even other tribes in Nigeria are clamouring for self determination, especially with the problem of the Boko Haram and the herdsmen. Ndigbo not interested in election, want restructure – Ugochukwu-Uko, Founder of Igbo Youths Movement, IYM and Secretary of the Eastern Consultative Assembly, ECA. All these are bunkum and balderdash. The Igbo position is clear: Nigeria must be restructured before fresh elections. Igbo people are not interested in any election, but Igbo leaders who are in the minority are the ones talking about election. 95 per cent of Igbo are not interested in an election where 60 per cent of voters in a section of the country are 12 to 13-year olds. They are saying there is no reason for election when the country is under great insecurity; they will not vote in an apartheid Nigeria where the Fulani hold 98 per cent of top security appointments and Igbo are maltreated.
. They are plainly fed up with Nigeria as presently constituted. All they desire is to see Nigeria returned to the way it was before Gen. Yakubu Gowon unilaterally created States in May 1967, thereby abolishing the regions. Our people are split into two groups, those who want out completely and those who want Nigerians restructured before next years’ elections. Those allotting a particular year to Igbo president are seen as clowns, jesters, enemy of the people and entertainers. 99% of the people are not interested in elections. They are tired. A country where Fulani herdsmen rule the land, kill at will and are clearly above the law. The most important thing to Ndigbo and other Nigerians is restructuring of the country so that the youth will realise their potentials. The President General and the leadership of Ohanaeze Ndigbo have repeatedly said that our people will negotiate with those they will support to know what is there for them. Ohanaeze is not a partisan organisation, so it will be wrong to talk about support to President Muhammadu Buhari, the ruling All Progressives Congress, APC, the opposition Peoples Democratic Party, PDP, or any other party or individual for that matter. Our interest is not on lgbo presidency but on good and purposeful, devolution of powers and respect for the lives and dignity of all individuals and tribes in Nigeria. Now every security agency is headed by the North, every military and para-military agency is headed by the North. Every anti-graft agency is headed by the North and virtually Fulani. human beings? That is why we have severe insecurity all over the place because, at the top security echelon, there is no cross-fertilisation of inter-regional security initiatives. So, today, in a bid to sustain northern political hegemony, we are playing politics with security and Nigerians are killed in their tens and hundreds incessantly. Until we restructure to address these imbalances and shelve the Federal Government of many items on the Exclusive Federal list and assign them to the states, Nigeria will remain like a stationary machine; all motion, no movement. If we restructure Nigeria today, all the increasing agitations for self determination from Biafra, Ijaw, Oduduwa among others will subside appreciably. To be candid one cannot single out the pains, Ndigbo are suffering under President Buhari which other Nigerians are immune from. Except he is not sharing money. One cannot, in all honesty, categorise Mr. President who is constructing and jump-starting Enugu-Onitsha Highway, Enugu-Port Harcourt Highway, Second Niger Bridge, Enugu Water Scheme, Abakiliki and Aba township roads, Aba-Calabar Road, Western Corridor railways, etc. ; as one inflicting unnamed pains on my people. Rather, those who allowed our critical infrastructure to collapse, impoverished us, created the material conditions for gross unemployment; while enriching themselves as hitherto – ministers under the past administrations – are the ones who callously inflicted pains on Ndigbo and by extension Nigerians. As per the chances of any Igbo man or woman becoming president of Nigeria soonest, President Buhari presents the best option. The first point which will make me and many Nigerians to vote for him is because of the massive critical infrastructure – Roads, Rails, Agric and Power projects (RRAP). It is unprecedented – 5,000 kilometers of federal roads, 5,000 kilometers of standard gauge rail lines, agrarian revolution and additional 5,000 megawatts of electricity. Allowing Buhari to do a second term will be as bad as one opting to burn from fire to hell. It would be better to allow a broad-minded patriotic northerner to replace Buhari in 2019. His tenure could be negotiated. Leaving Buhari to go for a second term would amount to unmitigated disaster. The post 2019: Igbo leaders rule out support for Buhari appeared first on Vanguard News.